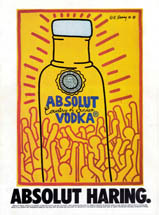 This ad by openly gay artist Keith Haring is typical of his style when he was being non-sexual. The ad is one of many from Absolut behind artists, including a more specifically gay-themed ad by Spada. But unless a person was familiar with Haring, they may not know his sexuality...similar to a later Absolut Ford ad of fashion designer Tom Ford. Alcohol is by far the most crowded category in gay marketing, with over 40 brands jostling for attention. Perhaps the most consistent presence has been Seagram's Absolut vodka for over 17 years, but Miller Brewing Co. has also had a mixed presence in gay media since the mid-1970s. Somewhat impervious to early fears of criticism from religious conservatives that other marketers worried about, so-called "sin products" such as alcohol also had something no other marketers did before the 1990s – an easily quantifiable marketplace: gay bars. They didn't need to do research to find out how much gays purchased their products, they just looked at their sales.